Oregon football is known for coming out on top of the Pac-12 at the end of each season. They finished their 2014 run winning the conference championship, the Ducks did the same in their 2011 season, and in their 2010 season when the conference was originally called the Pac-10. However, in recent history Duck football hasn’t been the only sport that Oregon could boast as a Pac-12 power. Oregon’s basketball, baseball, softball have risen to power of late in the conference. Oregon basketball has very recently emerged as a serious team in the Pac-12. Ever since finishing their 2010 season ranked No. 7 with a record of 7-11 for conference play, the Ducks have been on the rise. After the 2010 season, the Ducks had a complete turn around finishing the 2011 season ranked No. 3 with an in conference record of 13-5. In the 2012 season, Oregon added to its success by finishing No. 3 with a record of 12-6, they also came home to Eugene that season as the Pac-12 tournament champions. The following year the Ducks wrapped up their season finishing No. 3 in the conference once again. 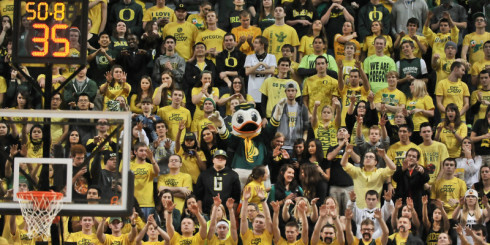 The Duck celebrates in Matt Knight Arena. This year for Oregon basketball has been phenomenal. They finished conference play with a record of 13-5, and are also heading into this year’s Pac-12 tournament ranked No. 2 with a first round bye. As for Oregon baseball, the team has found very recent success in Pac-12 play under head coach George Horton. In 2013, the Duck Baseball finished their season ranked No. 2 in the Pac-12 and went 22-8 for conference play. The following year in 2014, they finished conference play ranked No. 4 with an in conference record of 18-12, the team went on to earning 2nd place in regionals. This season the Ducks are currently 13-3 and are tied for 2nd place in the Pac-12 rankings. 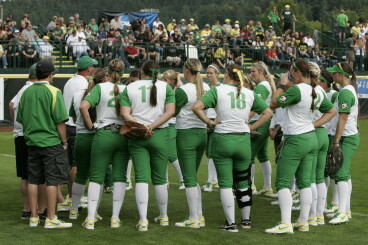 Oregon softball has been improving with every season, they finished their 2013 season ranked No. 1 in the Pac-12, wrapping up their season with a conference record of 19-5 and an overall record of 50-11. Last season in 2014, Oregon finished ranked No. 1 in the Pac-12 and went 20-3 for conference play, and 56-9 on the season. Last season the lady Ducks lost in the semi-finals of the NCAA tournament to the Florida Gators, who eventually went on to winning the tournament. This year the Oregon Softball is currently 20-3 on the season, and is currently ranked No. 2 in the Pac-12 conference. The Oregon Ducks continue to make their case as a dominant Pac-12 power with each year. The Ducks are proving that each athletic team can finish each season at or near the top of Pac-12 standings.